Often users run into situations where the scheduler button does not do anything when running Syncrify client on Windows 7. To see exactly what is going on refer to the SyncrifyClient.log file on the client machine. The most common reason for this error is that you have installed the 32bit version of Syncrify but are using 64bit version of Java VM to run it. Make sure you install the 64bit version of Syncrify with Java VM. (Do not download the 64bit version without VM). You will have to uninstall the existing version and reinstall the correct binary. Reinstalling will keep your profiles intact. When you create a scheduled task, the OS creates a .JOB files for this schedule. If a file or a scheduled task is created using the elevated privileges on Windows 7, Vista or 2008, that file cannot be modified when you run Syncrify as a regular user. 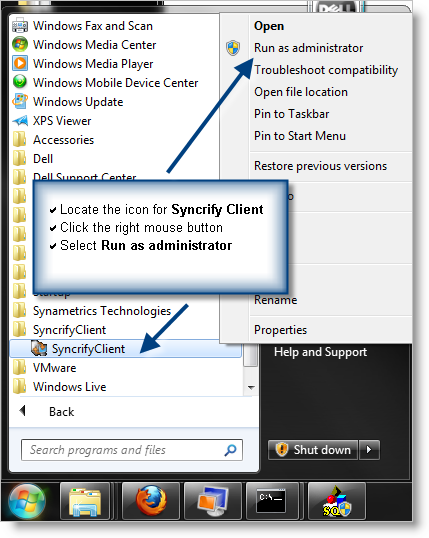 First, locate the icon for Syncrify Client among All Programs, click the right mouse button and select Run as administrator. Click here for an image. 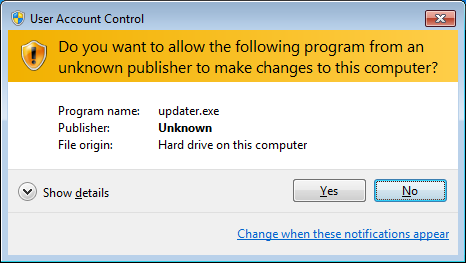 The operating system will display a UAC prompt. You must click OK to proceed. Exit Syncrify and restart it using a regular user. Now create a brand new schedule. This schedule will now be owned by a regular user and you will be able to modify it as a regular user.